Higher-order moments, minima and maxima of turbulent temperature and water vapour mixing ratio probability density functions measured with an eddy-covariance system near the ground were related to each other and to vertical boundary-layer profiles of the same scalars obtained through airborne soundings. The dependence of kurtosis on squared skewness showed a kurtosis intercept below the Gaussian expectation, suggesting a compression of the probability density function by the presence of natural boundaries. This hypothesis was corroborated by comparing actual minima and maxima of turbulent fluctuations to estimates obtained from the first four sample moments by fitting a four-parameter beta distribution. The most sharply defined boundaries were found for the minima of temperature datasets during the day, indicating that negative temperature fluctuations at the sensor are limited by the availability of lower temperatures in the boundary layer. By comparison to vertical profiles, it could be verified that the turbulent minimum of temperature near the ground is close to the minimum of potential temperature in the boundary layer. 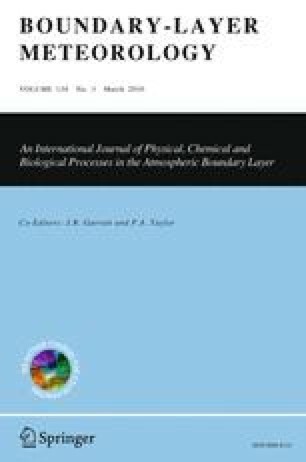 The turbulent minimum of water vapour mixing ratio was found to be equal to the mixing ratio at a height above the minimum of the temperature profile. This height roughly agrees with the top of the non-local unstable domain according to bulk Richardson number profiles. We conclude that turbulence statistics measured near the surface cannot be solely explained by local effects, but contain information about the whole boundary layer including the entrainment zone.